Last minute coaching advice from injured skipper Leigh McMillan helped the crew on Oman Sail’s GC32 Sultanate of Oman to step up their performance and take class honours in the 2015 JP Morgan Round the Island Race, one of the largest yacht races in the world. After breaking his hand on Thursday, McMillan passed helming duties over to Paul Campbell-James (CJ) who is one of the UK’s most experienced foiling experts but it was McMillan’s coaching tips that resonated as they were hurtling around the back of the Isle of Wight crashing off waves at 30 knots, CJ said. “Leigh spent some time with us all on Friday and it made a big difference,” said CJ. 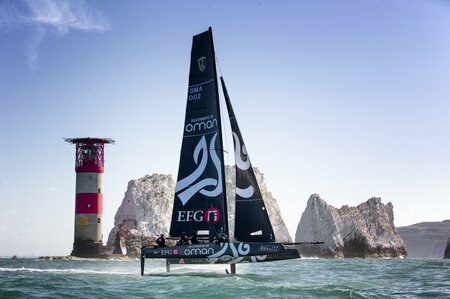 Sultanate of Oman crossed the finish line at precisely 11:00:31 local time to win the GC32 class with a time of 03:50:31. It was just 56 seconds ahead of Alinghi with whom they had jostled for the lead all the way round the course in conditions described by trimmer Pete Greenhalgh as ‘exciting’. “It was extremely lively round the back end of the island – 16-18 knots and very, very rough,” he explained. “We were crashing off the foils, leaping out of the water doing 25-30 knots and stopping down to 7-8 knots. These are the roughest conditions we have had in these boats and it was one of the roughest rides any of us have ever had. We are all a bit battered and bruised. Back in 2010, bowman Nasser Al Mashari came second in the Extreme 40 class but today he went one better with a win. “We were third GC32 to go round the Needles but we fought hard, used every little bit of pressure, every wave. It was very choppy but from then on we had some great racing. I am very happy and extremely proud to have won our class at the Round the Island Race,” he said. As well as taking the class win, Sultanate of Oman were the second boat in a massive fleet of 1,584 boats to cross the finish line. Concise, the MOD70 owned by Tony Lawson, recorded a time of 03:30:24 to take the Freedom Challenge Bowl. There was just six minutes difference between the first and last GC32 with third placed French boat Team ENGIE posting a time of 03:53:47 and Team ARGO from USA 03:56:06. The next event on the Bullitt GC32 Racing Tour is in Kiel, Germany from 29 July – 2 August.